Oaklawn Plantation was built in 1830 by French planter Narcisse Prudhomme. It is an excellent example of a large French Creole plantation house with many of the typical aspects of this architectural style, including its full floor elevation off the ground and a gallery that sweeps around three sides of the house. The house is particularly interesting for the majestic oak alley at its entrance. Measuring 680 feet, it is the third longest oak alley in the state. Narcisse Prudhomme was a member of the affluent Prudhomme family that controlled much of the land along the Cane River. Narcisse was a successful planter who owned more than 100 slaves and had a personal estate valued at $124,690 by the time of his death in 1859. The plantation passed to his son, Achille Prudhomme, who—following in the footsteps of his father—became a successful planter as well. The home survived the Civil War, although the plantation ran into many financial problems during Reconstruction. After Achille’s death, his widow and children broke the plantation up and sold off the property in lots. The house passed through many hands in the following years. In 1916, Oaklawn finally returned to the Prudhomme family when Charles Edgar Cloutier, the husband of Adeline Prudhomme, the great grandniece of Narcisse Prudhomme, purchased the house and some of the plantation’s former property.The house remained within the family until recently, when it was purchased and restored by playwright Robert Harling. Harling is best known for his play and movie, Steel Magnolias. The story was based on events that happened to Harling during his early life in Natchitoches. The film version of the story was filmed in Natchitoches in 1988, bringing attention to the Cane River region and sparking its tourist industry. 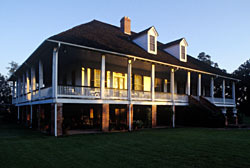 Oaklawn Plantation is located on Hwy 494 east of Natchez. It is a private residence and is only open to tours on special occasions. 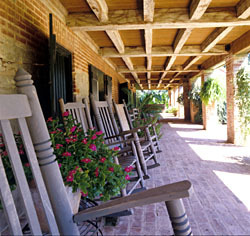 Oaklawn Plantation has also been documented by the Historic American Buildings Survey.